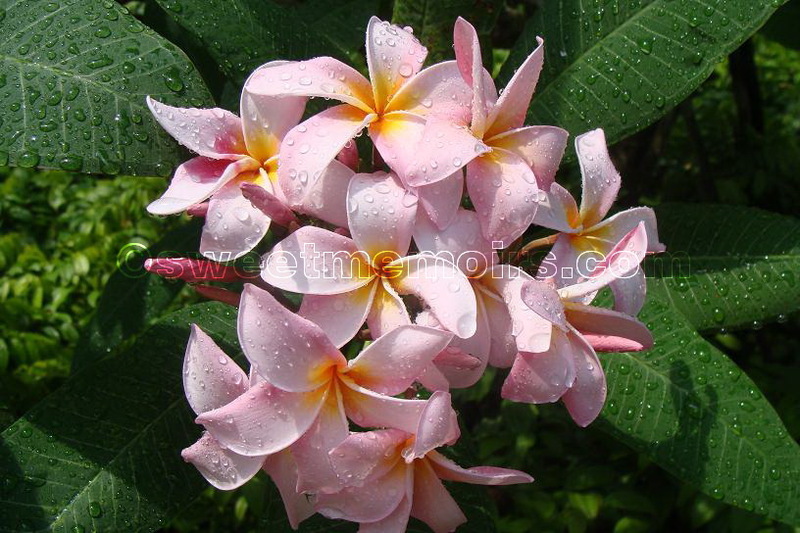 Plumeria (common name Frangipani) is a genus of flowering plants of the family that includes Dogbane: the Apocynaceae. It contains 7-8 species of mainly deciduous shrubs and small trees. They are native to Central America, Mexico, the Caribbean, and South America as far south as Brazil but have been spread throughout the world's tropics. Gorgeous flower & very nice shot. In Malaysia and Singapore, they call this graveyard flowers. You see them in graveyards of the Muslims. don't know why they grow only this flower. Must ask my Muslim friend from Singapore. Here in NZ, it is liked very much. Such a lovely flower and exquisite color! Wonderful capture, Cher! Thanks for sharing the beauty! beautiful! and they smell good, too. Now this is the real frangipani! It smells divine and they use it to decorate flowers for the dead. What a pretty flower, - the water droplets add to its beauty! Beautiful flower and your photo, too. Beautiful flower with a touch of jewels! Happy weekend, Cher.. The flowers is beautiful because of you. signs of life.. your pink is wonderful. The site of that pink Frangipani took me back a few years to a Bali conference and a week of sun, great food and loads of fun! Lovely presentation of this beautiful blossom, Cher. You can never imagine how many leis we made while living in Hawaii of this breathtaking flower. You captured it beautifully. What a lovely flower. I have never seen them. I am sure they would not grow here but would love having one. I just left you a comment...and it was wrong!!! I had two pages open at the same time...the phone rang and I commented the wrong comment!!! I love the photos you shared this week!!! It is a beautiful plant! I am just so happy to have the chance to visit here today!! Wouldn't it be wonderful if we all could tour each friday's flaunting gardens together and in person? I would love it! I wish I had more time to visit all of my favorites everytime you post! Thank you so much for linking in and sharing your post with my party today! I have shared your post this week with the Tootsie Time Facebook page. psstttt such beautiful pink petals "cherrifically" shot as always!